Since discovering citrus canker in a Darwin nursery earlier this year, the citrus canker response team have been working tirelessly to trace host plants across the Northern Territory, and the rest of Australia. This tracing work led the Department of Primary Industry and Resources (DPIR) to a property in Katherine, where citrus canker has now been confirmed. The 15 acre property was home to four citrus plants, with only one showing serious symptoms of the disease. 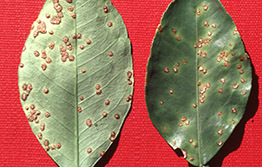 Secondary testing conducted last week confirmed the diagnosis of citrus canker. This detection will require additional movement restrictions, with a new restricted area and control area to be announced shortly. These areas will be defined using the same methods as the existing restrictions. 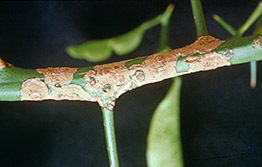 The restrictions apply to the movement of a list of potential citrus canker host plants and any parts of those plants. These plants cannot be moved into, out of or within the restricted areas. Propagation of these plants is also prohibited in the restricted areas. The Katherine restricted area will cover a defined area in Cossack. All properties within this area will be receive information from DPIR response staff, and be visited for inspection. A wider Control Area will also be established over the whole Katherine Local Government Area (LGA), from which citrus plants cannot be removed. DPIR’s Chief Plant Health Officer Sarah Corcoran said the new detection highlights the importance of tracing work being undertaken at the Citrus Canker Response Centre. “The infected plant was purchased from a Katherine nursery, which sourced their citrus plants from a supplier in Darwin,” she said. “We were able to identify the location of the plant thanks to the assistance of the local nursery. “This detection reinforces the value of the efforts being made in tracing host plants across the Northern Territory, and strengthens the belief the disease has not spread naturally. “If you live or work in the Katherine area, please do not move any citrus plants, and contact the department if you think your plant may be infected. Restrictions that prohibit the movement of NT citrus interstate remain in place. If you think you have a plant with citrus canker you can submit your photos and contact details via the online form at dpir.nt.gov.au/reportcitruscanker or contact the citrus canker hotline on 1800 931 722.